OVERLAND PARK, Kan., February 13, 2019	(Newswire.com) - The KU Edwards Campus (KUEC) in Overland Park, Kansas, is helping local businesses invest in the professional development of their employees with its various leadership programs, including its newly launched University of Kansas Professional Leadership Certificate. For today’s employees, it’s not always about just making it through an eight-hour shift to collect a paycheck and relax at home. Many need more from their employment to remain with and give their best to their employer. To increase employee retention and productivity, employers must understand that employees value professional development now more than ever. Fifty-one percent of today’s workers are looking to leave their current jobs, according to a Gallup survey. The chances employees will stick around are far higher with a strategic leadership training program. According to a Bridge study, offering career training and development would keep 86 percent of millennials from leaving their current position. In fact, a recent Udemy study revealed 42 percent of millennial employees say learning and development are the most crucial aspects when deciding where to work, followed by health insurance. 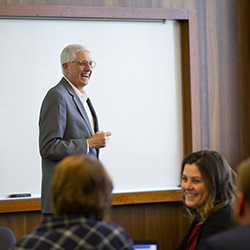 Stuart has spent more than 30 years working with all types and sizes of businesses in the private sector and said Kansas City businesses are beginning to understand improving soft skills needs to be a top priority for managing their multi-generational workforce. One of those businesses is Arvest Bank, a financial institution with 17 branch sites in the Greater Kansas City area. Barbara Christ, the executive vice president of sales with Arvest, utilizes several of KUEC’s leadership programs for her employees and offers them the opportunity to complete The University of Kansas Professional Leadership Certificate. With today’s rapidly changing workplace, it’s difficult for employees to stay up to date on the latest technologies and skills needed for success in any industry or organization. Employers need to continually provide training opportunities for their associates including soft skills such as critical thinking and emotional intelligence. Productive employees can also help companies by staying relevant in their industries, solving problems in useful ways and bringing value to their customers, all leading to sales growth. The KU Edwards Campus serves the Kansas City region with high-quality academic, professional and continuing education programs to serve the diverse workforce needs of the community.